In 1994, the Westfall Company teamed with the engineering group of Kerr McGee Coal Company to address corrosion problems at the Galatia, Illinois coal preparation plant. The coal preparation environment can cause significant deterioration of carbon steel within two years and stainless steel in less than six. Kerr McGee’s goal was to use as much non-metallic structural products as possible in the design of a new section of the plant. 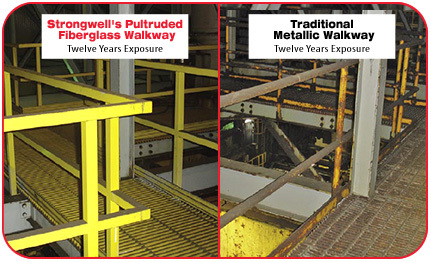 Strongwell’s SAFRAIL™ square tube industrial handrail combined with DURADEK ® I-6000 grating and stair treads were specified in all areas of the new section. While the section was under construction, the maintenance supervisor for the preparation plant requested using these same products in other areas of the plant. Kerr McGee was so impressed with Strongwell’s fiberglass products they elected to replace handrail throughout the coal prep plant with Strongwell’s SAFRAIL™ handrail. After twelve years of service, Strongwell revisited the plant which is now owned by American Coal. The results were a testament to the resilience of pultruded fiberglass. There had not been a single corrosion related problem, while the metal structures and components around the fiberglass railing and platforms were failing.